We invite you to enjoy Frances Klatzel’s photo essay describing life in the Khumbu. The humor, spirit, courage, and especially the reverence and humility that pervade the Sherpa’s life in the shadow of the highest peaks on earth are alive in these images and words. 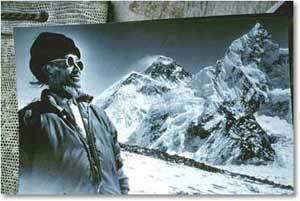 For years Frances’ book “Stories and Customs of the Sherpa” has been our favorite to use as an introduction to life in the shadow of Everest.. If you would like to learn more about Frances’ work, please check her website www.merapublications.com. Most everyone has heard of the Sherpas through the literature of mountaineering. This awesome reputation however, focuses on a single vocation rather than on the Sherpas’ rich cultural heritage. 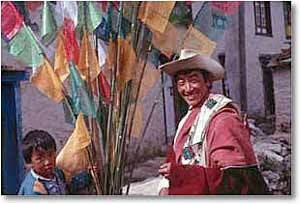 The Sherpas originated as several families who migrated from eastern Tibet and settled uninhabited valleys in the Himalaya about 400 years ago. Their name “Sher-pa” reflects those origins: “east-people”. 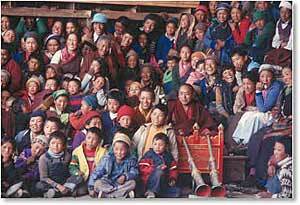 This small group of families brought with them the rich traditions, religion and literature of Tibetan Buddhism. The Sherpas built their houses on any landform flat enough for agriculture, such as the ancient hanging terrace of Phortse, the glacial trough of Khunde and Khumjung, and the bowl-like valley of Namche. Their villages face south for more favorable growing conditions, and lie between 7,000 and 15,000 feet above sea level. Most Sherpas have a home in one of the main villages of Khumjung, Khunde, Thamechok, Namche, Pangboche, and Phortse, but often stay seasonally in huts at the high pastures. Here, the cold climate allows the Sherpas to cultivate only one harvest a year from their rock-strewn fields. To survive in this formidable environment, the Sherpas have always engaged in another livelihood whether trading across the Himalaya or migrating in search of employment. For much of the late 1800s and early 1900s, Sherpas migrated in search of employment to British-ruled Darjeeling. Sherpa men first worked as high altitude porters on British attempts to scale the great peaks of Sikkim in 1907, and have worked on every major Himalayan mountaineering expedition since then. Mountaineers praised the Sherpas’ friendliness, loyalty and dependability. This mountain of many names has always attracted pilgrims, whether Tibetans honoring a peak they believe is the abode of a deity, or climbers and trekkers fascinated by the highest point on earth. Sagarmatha is the name given by the Nepali government in the 1970s and the name Everest was given by the British in India. “Jomolungma is the name of the mountain. Jomo Miyo Lang Sangma is the name of the resident female deity. 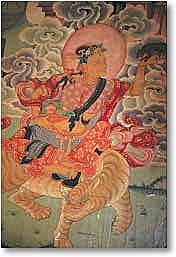 She is a mother goddess and one of the five sisters of long life, so many pilgrims used to go to see her in Tibet. Now, people, from all over the world, come to see Jomolungma, from Khumbu." “It is the temperament and character of the Sherpas that have justified their renown and won them such a large place in the hearts of the Western travelers and explorers who have known them."